A fair system is one where a borrower who opts for a floating interest loan would pay more when interest rates rise and gets the benefit of a reduction in rates automatically. In India, lenders quickly hike interest rates by increasing the repayment tenure as soon as interest rates inch up, but are happy to fleece the hapless borrower when rates fall. What is shocking is that the difference in interest charged can be as high as 5%. Consider the case of Satyam Savla, who took a floating rate loan from HDFC Bank in 2007. It was to be repaid in 108 equated monthly instalments (EMIs). His interest rate zoomed to as much as 17.3% by 2010-11. This was almost as high as the rate applicable to unsecured loans at that time, he says. However, Mr Savla says that HDFC Bank did not bother to inform him and he was clueless about the highly beneficial change. 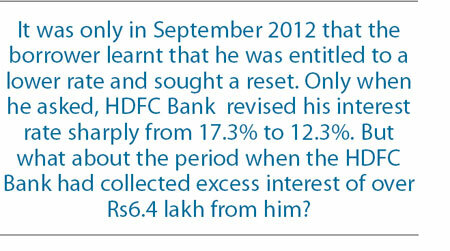 It was only in September 2012 that he learnt that he was entitled to a lower rate and sought a reset. The interest rate on his loan was then revised sharply downwards to 12.3%, in November 2012. But what about the intervening period (between June 2010 and November 2012) when the Bank had collected excess interest of over Rs6.4 lakh from him? In 2016, he realised that the Bank had extracted a higher interest by simply increasing his repayment tenure to 122 EMIs. These were subsequently reduced to 114 in 2012, when the interest rate was reset at his request. Since then, he has written innumerable letters to the Bank and to its managing director, Aditya Puri, to no avail. Mr Savla then filed a complaint with the banking ombudsman (BO), but this was also rejected and the case was closed. Why did this happen? We learn from Dr KC Chakrabarty, former deputy governor of RBI, that the issue goes back to 2008, when the finance ministry permitted discriminatory treatment of different classes of borrowers, by allowing banks to offer lower rates to new customers. 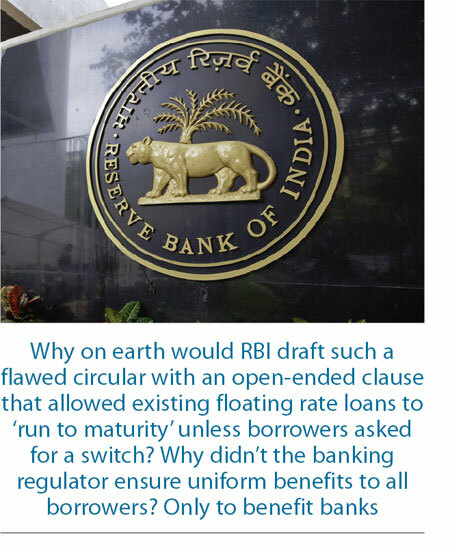 Why on earth would RBI draft such a flawed circular with an open-ended clause that allowed existing floating rate loans to ‘run to maturity’ unless borrowers asked for a switch? Why didn’t the banking regulator ensure uniform benefits to all borrowers? Only to benefit banks. It is possible that some banks did inform borrowers about the change. It is also likely that many borrowers made inquiries after reading media reports. Government banks do an annual review and may reset rates. But, clearly, each bank does what it wants to. During Dr Chakrabarty’s tenure, a complaint to the BO often helped the customer. But that, too, does not seem to work anymore, going by Mr Savla’s experience. Mr Savla insists that HDFC Bank did not inform him of the change to base rate. Here is what happened with his complaint to the BO. The Bank Ombudsman’s order says that, after seeking information from the Bank, it is convinced that the change in rate of interest was communicated to Mr Savla by SMS and post and “after following the due procedure of communication the same was implemented by the Bank.” Amusingly, the Bank apparently pointed out that “Information regarding the Base Rate was displayed on their Website and on the notice board of all the Branches as per the Bank Board approved policy.” Did the BO ask HDFC Bank to produce proof of how it had intimated the change in policy to Mr Savla? Was it the SMS produced? We don’t know. Unfortunately, discrimination against borrowers is officially sanctioned and it will not change without determined and concerted and collective protests by those who are affected. Is the BO correct in its interpretation? Well, consider the rules applicable to credit cards which were also framed only after usurious charges levied on customers led to an uproar. In the case of credit cards, it is mandatory for banks to explain relevant terms and conditions such as fees, charges and applicable interest rates, billing and payment, method of computation of over-dues and renewal and termination procedures. But that is not all. Banks are also required to, separately, give a copy of the Most Important Terms and Conditions applicable to the credit card at the time of application. Why shouldn’t similar, non-discriminatory rules apply to mortgage, where the borrowings are significantly larger? A proactive BO would have taken a holistic approach, instead of looking at whether certain boxes were checked. And a fair regulator would have ensured that borrowers get just and non-discriminatory treatment through its regulations. This brings us to The Charter of Customer Rights issued by RBI on 3 December 2014, under its rock-star governor Raghuram Rajan. In 2017, the Charter remains a meaningless motherhood statement that is unoperational. 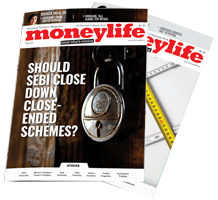 Moneylife Foundation has recently written to governor Urjit Patel, pleading that the Charter be given more teeth. We are awaiting a response. The Charter recognises five basic rights of bank customers: right to fair treatment; right to transparency, fair and honest dealing; right to suitability; right to privacy; and right to grievance redress and compensation. Here, too, we learn that the right to fair treatment included non-discriminatory treatment between borrowers; but this was dropped under pressure from banks. A simple reading of Mr Savla’s case shows that the first, second, third and fifth rights have been violated by HDFC Bank if its so-called communication to Mr Savla did not reach him. Mr Savla’s next option is to go to court. But, as the Bank knows, it is likely to cost him more than the extra interest he paid. After 1 April 2016, RBI has changed the rules, again without any discussion with borrowers and allowed banks to link loans to their marginal cost of funds based lending rate (MCLR). They have the freedom to lend at MCLR or insist on a mark-up. Most ordinary borrowers are clueless about this, or how the loans are reset, now that interest rates have dropped. Worse, banks are allowed to reset rates only once a year, which means that they do not have to pass on the benefit immediately. This is again discriminatory to borrowers, especially when financial literacy is abysmal. RBI’s treatment of borrowers, based on one-sided contracts, would probably be struck down by a court of law as unconscionable or as one-sided contracts. The question is, who will bell the cat? Please write to Moneylife Foundation at foundation@moneylife.in, if you have questions or issues; we are trying to find a way to represent the borrowers’ case to policy-makers. Do You Have a Floating Rate Loan/ Mortgage? Have you got the benefit of lower interest rates? Please take this survey and tell us if you find the system fair and transparent. Help us to help you by collating data and taking up the issue with policy makers. Pl let me know the intervels in which floating rate changes. You should know your spread rate when you availed the loan. then for every quarter you need to check RBI reporate and RPLR of your bank. I have closed all accounts with this Bank. Usurious charges for not maintaining AMB...despite there being more than adequate funds in other accounts with them and to transfer shortfall if any went unheard. How else will they maintain the market superiority and get a premium pe. The clients foot the bill and that fits the bill of all the high class performers there. I believe that is a mistake. Withdraw all money and engage them in endless correspondences, accusing them of swindling and looting. Stress them at least 1000th of the stress they load us with. You gave them a walk over. It is deplorable that a premier bank like HDFC resorts to such a rip off of unsuspecting middle class customers. As per Basel requirements, the more the grievances and complaints against a bank, the more risk capital it would have to set aside. I urge all HDFC customers ( and other banks too) to write their grievance s to the bank or on their customer portals so that this is viewed by all. Despite so many complaints, how does Mr Puri bag the award for the best banker? Is this award also rigged? HFC big guns should seriously introspect on their business practices. I haven't seen any forum (and I'm reasonably well read and informed) which is fighting to safeguard consumer interest on this front. Perhaps the banking ombudsman's office needs to build a mechanism for consulting with independent research firms like Money life to stay abreast of the malpractices by financial institutions. I had been asking for switch for the existing loan from higher interest rate to current lower rate but unfortunately for the past 10 months asking for a huge fee or asked me to buy a endowment policy to compensate for the fee. I had to run multiple times to visit the branch and they kept making money from my higher interest . I am surprised if no fee is charged for switching why have they used this tri k to sell their policy . Since I was loosing money on higher interest rate I choose to take their product which otherwise I would not have taken. The new generation private sector banks are very fast in marketing loans.But they don't care about RBI guidelines favourable to borrowers.Penalty for pre payment of loans was removed long back.But still HDFC bank never implemented the provision and squeezing the customers for many more years.Loan will be arranged in one branch of our choice.But the documents like RC or Sale deeds will be released in a branch situated far away.Similarly opening a Demat account is very easy.But to close a Demat account you have to make at least 3 or 4 rounds to some other branch situated far away.Dont talk of hidden charges.Even for ex bankers like us ,they create problems.Then you can guess how they confuse and trouble other ordinary customers. This problem was brought to the notice of RBI long back. Instead of solwing the issue RBI changed the prime rate to base rate and now MCLR facilitating further abuse of the system. This was also put in PGPORTAL also but that forum is also waste of public money and time any absurd reply will be accepted and complaint is closed. May be it is time for SIT set up by Supreme Court on black money to investigate role of RBI in facilitating and promoting round tripping and money laundering by abducting its duty under FEMA during 2005 onwards. It seems(and rightly so) that the complaints against HDFC Bank are more than the complaints against all banks combined! Banks have lost heavily due to Corporate NPAs and their profitability is severely affected.For this loss RBI also is responsible covertly or overtly.So RBI is also supporting the Banks by issuing such circulars to squeeze honest borrowers as much as possible.This is how they want to recoup losses incurred through corporate NPAs partly. Thank you for stating many truths & busting away overhyped myths about Indian banks. Periodically various journos & jingoistic columnists keep screaming 'aiyo aiyo' whenever the word Sharia Banking gets mentioned. Who knows Sharia Banks co-existing with nationalised banks in India might provide the much needed checks & balances. If what they offer appeals to me I might even consider transferring some of my savings there. HDFC offers 8.9% to old loyal loan payers that too with transfer/conversion fees and 8.6% to customers who are ready to shift from a different bank/institution. Loyalty does not matter ..Terrible. The banks should be made to examine their accounts and repay every customer whom they've cheated in this way. Why should the borrower have to ask to have his/her interest rate reset? It's bizarre that instead of forcing the banks to repay the customers they've defrauded, RBI issues a circular meant to further help the banks in their cheating. One truly begins to wonder: how can all this be going on? Is there no law? The State Bank of India should come with a voluntary retirement scheme after considering the overall staffing picture after merger of five associate banks instead of the five announcing such a scheme before the merger, said the leader of a major bank union. "The five associate banks of State Bank of India (SBI) will soon come out with a voluntary retirement scheme (VRS) as their boards have approved the a scheme. The scheme will be introduced and closed before April 1, 2017, the day on which the merger takes into effect," All India Bank Employees' Association (AIBEA) General Secretary C.H.Venkatachalam told IANS here on Friday. According to him, launching a VRS for the employees of the five associate banks alone is not fair as those who do not opt for retirement and land in the SBI may feel disadvantaged psychologically from day one of the merger. Venkatachalam said branch and staff rationalisation could be look at by the SBI post merger after taking into account an overall view of the operations. On Thursday, the SBI in a regulatory filing in BSE said: "We advise that the Government of India has issued the orders ...under subsection of Section 35 of the State Bank of India Act, 1955... In terms of the said orders, the entire undertaking of SBBJ (State Bank of Bikaner &Jaipur), SBM (State Bank of Mysore), SBT (State Bank of Travancore), SBP (State Bank of Patiala) and SBH (State Bank of Hyderabad) shall stand transferred to and vested in the State Bank of India from April 1, 2017." The cabinet approved acquisition of associate banks by SBI on February 15. According to Venkatachalam, those employees (clerks and officers) who have put in 20 years of service or have completed 55 years of age may be made eligible to opt for VRS. He said the VRS will be open for 15 days from the date of announcement and employees have to exercise their option within that time limit. The VRS quantum may be 50 per cent of the salary for the remaining period of service subject to a maximum of 30 months salary. Venkatachalam said the bank may restrict the number of employees opting for VRS depending on the staffing needs. The private banks are worse than moneylenders. If they know the law, there is a principle called privy which means they should communicate to the borrower and get an acknowledgment from him. They cannot hide under the rules which are in most cases unknown to the borrower. A borrower is not expected to know the banking jargons, linkage to MCLR and all that. The case cited is fit for a battle and ruling in favor of the borrower. The private banks think they are clever in fooling the public. Imagine the plight of poor. The creation of a 'bad bank' could accelerate the resolution of stressed assets in India's banking sector, but it may face significant logistical difficulties and would simultaneously require a credible bank recapitalisation programme to address the capital shortfalls at state-owned banks, says a research note. In the report, Fitch Ratings says, "We estimate that the banking sector will require around $90 billion in new total capital by FY2019 to meet Basel III standards and ongoing business needs. This estimate is unlikely to be significantly reduced by the adoption of a bad-bank approach, and could even rise if banks are forced to crystallise more losses from stressed assets than we currently expect. We believe that the government will eventually be required to provide more than the $10.4 billion that it has earmarked for capital injections by FYE2019 - be it directly to state-owned banks or indirectly through a bad bank. According to the ratings agency, India's banks have significant asset-quality problems that are putting pressure on profitability and capital, as well as constraining their ability to lend. Fitch says it expects the stressed-asset ratio to rise over the coming year from the 12.3% recorded at end-September 2016, which is significantly higher among state-owned banks. Asset-quality indicators may be close to their weakest levels, but the pace of recovery is likely to be held back by slow resolution of bad loans, it added. A bad bank that purchases stressed assets and takes them to resolution was featured in the government's latest Economic Survey, and in a speech earlier this week by a senior official from the Reserve Bank of India (RBI). The most likely form of bad bank would be that of a centralised asset-restructuring company (ARC). Its proponents believe it could take charge of the largest, most complex cases, make politically tough decisions to reduce debt, and allow banks to refocus on their normal lending activities. Similar mechanisms have previously been used to help clean up banking systems in the US, Sweden, and countries affected by the Asian financial crisis in the late 1990s. Senior European policymakers have recently discussed the prospect of a bad bank to deal with non-performing loans (NPLs) in the European Union (EU). Fitch says it believes that a bad bank might provide a way around some of the problems that have led Indian banks to favour refinancing over resolving stressed loans. "For example, large corporates often have debt spread across a number of banks, making resolution difficult to coordinate. The process would be simplified if the debt of a single entity were transferred to one bad bank. This could be particularly important in India's current situation, with just 50 corporates accounting for around 30% of banks' stressed assets," it added. 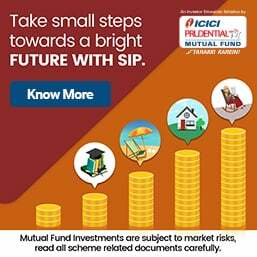 According to the ratings agency, several small private ARCs already operate in India but they have bought up only a very small proportion of bad loans in the last two years, as banks have been reluctant to offer haircuts on bad loans even where they are clearly worth much less than their book value. "This is, in part, because haircuts invite the attention of anti-corruption agencies, making bank officials reluctant to sign off on them. Reduced valuations also increase pressure on capital". A larger-scale bad bank with government backing might have more success, Fitch says, adding, "It however, is unlikely to function effectively without a well-designed mechanism for pricing bad loans, particularly if the intention is for the bad bank to be run along commercial lines and involve private investors. One estimate from the Economic Survey suggests that 57% of the top 100 stressed debtors would need debt reductions of 75% to make them viable. Banks would need capital to cover haircuts taken during the sale of stressed assets, and the bad bank would most likely require capital to cover any losses incurred during the resolution process."